I had a dentist appointment this morning (ugh), so I never really had the opportunity to sit down and do a Linky Thursday post (have no fear, I’ll post tomorrow). So, instead, I thought I would show you another Jalie pattern that I had the opportunity to test… the Mimosa scoopneck t-shirt(s)! 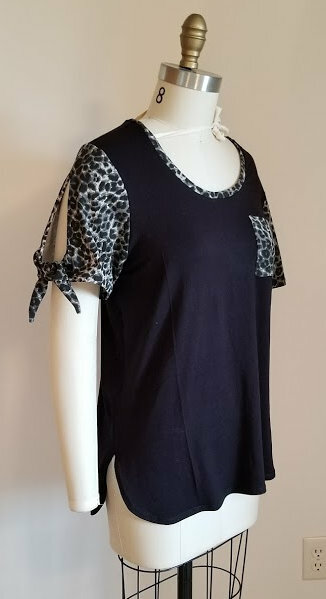 This is a relaxed tee that has a curved hem with a side slit, scooped neck, and several sleeve options: a short rolled sleeve, a short sleeve with ties, and a long sleeve with optional shoulder flounce. I actually tried two of these; the long sleeved version (without the flounce) in a double brushed poly and the short sleeve tie version made in a rayon poly type blend. Both of these are exactly what you would come to expect in a Jalie tee pattern – both of these versions whipped up quickly and look great on right out of the package. With that said, the tie sleeve version is definitely my favorite. Not only is it fun, it’s different than anything I currently have in my closet right now. 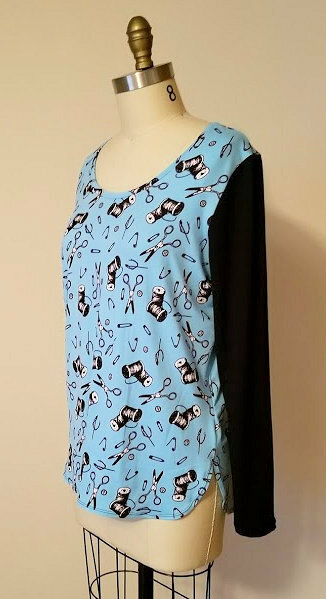 I do have plans to eventually make the rolled short sleeve version, but haven’t found the “right” material I want to use with it – so stay tuned for progress on the front! This entry was posted in Uncategorized on June 7, 2018 by stacy.